Service and Quality make us the go to people. Merry Christmas and Happy New Year. We will continue to take orders through the holiday period. Now in stock: PG 680XXL & CL 681XXL. $27.50 each with 10% discount for a set. 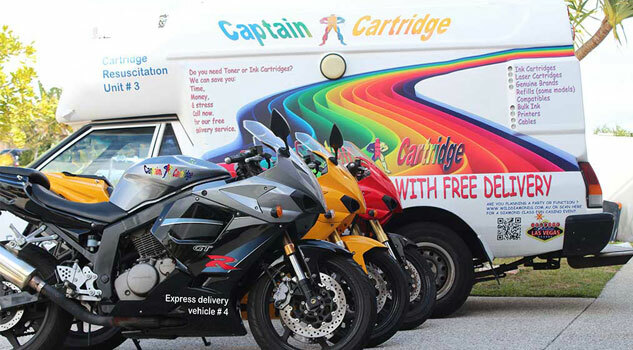 Captain Cartridge offers a free delivery service for all new genuine and new compatible ink cartridges & toner cartridges. All products delivered free and same day to the Sunshine Coast (subject to being in stock). Other products available are refill bulk inks, fax rolls, photocopier toners, USB cables, HDMI cables and specialty paper for all major brands including Canon, Brother, HP, Epson, Lexmark, Samsung, Fuji Xerox, Dell & Kyocera, just to name a few. Personalised delivery or onsite service operates from Pelican Waters in the South to Twin Waters in the North and all areas in between out to the Bruce Highway. Other areas may require a set minimum order, but will still get free delivery by courier. Why go to a shop when we come to your home or business and minimise your downtime. This is particularly helpful to the housebound elderly or parents with young kids at home. If you are a business owner or manager, you will be able to keep your staff working on more productive tasks. Call Captain Cartridge instead, we will save you money as we have the most reliable ink and toner cartridges on the Sunshine Coast, and the highest level of service. Our daily delivery area for personalised delivery is from Caloundra to Twin Waters and all areas in between including Alexandra Headland, Alex Beach, Aroona, Battery Hill, Bellvista, Bells Reach, Bli Bli, Birtinya, Bokarina, Brightwater, Buddina, Buderim, Caloundra, Caloundra West, Cartridge World, Coolum, Cotton Tree, Creekside, Currimundi, Dicky Beach, Glenfields, Golden Beach, Ink brothers, Little Mountain, Kawana Island, Kawana Waters, Kawana Forest, Kings Beach, Kuluin, Kunda Park, Marcoola, Maroochydore, Maroochy Waters, Moffatt Beach, Mons, Mooloolaba, Mountain Creek, Mudjimba, Nambour, Parrearra, Pelican Waters, Point Cartwright, Refills Now, Twin Waters, Warana, University, University Hospital & all surrounding suburbs. All other areas in Australia still receive free delivery for toners or 4 or more compatible ink cartridges.